Every year, I look forward to Cinco de Mayo. Of course I’m very happy for the Mexican Army’s successes over the French in 1863, but that’s not why I’m excited. Cinco De Mayo is the perfect excuse to finally crawl out of my winter cocoon and share some fresh, delicious Mexican recipes with my friends. Most definitely on the menu? Some of my favorite healthier Mexican dips and chips. I love making dips for a party crowd because they’re easy and everyone is so happy to learn that they’re not eating fat-laden store-bought dips. Bean Dip and Chile con Queso (see the recipes below) are lightened up versions of old classics with plenty of flavor, just light on the fat and calories. Add some salsa and guacamole, and you’ve got yourself a fiesta. Chile con Queso Our healthier version of chile con queso will have ooey-gooey-cheese lovers celebrating. OK. So Chili Con Queso isn’t exactly Mexican. More like Mexican-inspired, but it’s one of my favorite dips that I developed in the Test Kitchen. We weren’t sure we could make a healthy version of a recipe that’s essentially an entire pot of cheese melting on the stove, but we did. Here’s how: I got sneaky and melted cheese into milk thickened with a little cornstarch. And the secret ingredient? Beer. Just a splash gives this dip some real zing. It’s a winner. Our version cuts the calories in half and reduces total fat and saturated fat by nearly 60 percent. Quick Guacamole Use a cup of Fresh Tomato Salsa to make this easy guacamole. Mash a few avocados, stir in lemon juice and you're done! Guacamole will turn brown if allowed to sit and is best made shortly before serving..
Salsa Rojo Here's a homemade version of the tomato salsa served at taco stands and burrito joints everywhere. Try it with all your favorite Mexican foods—it even works as enchilada sauce. 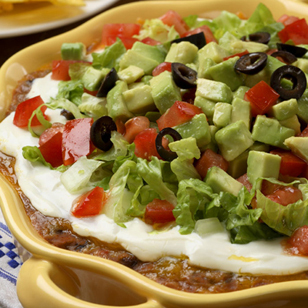 Southwestern Layered Bean Dip Plenty of black beans, salsa and chopped fresh vegetables mean a healthy amount of dietary fiber in this Tex-Mex layered dip. We use reduced-fat sour cream along with full-fat (and full-flavored) cheese to make the dip lighter without compromising great taste. Be sure to have lots of baked tortilla chips on hand when you serve it.